From trying to figure out how plate tectonics work, to seeing how you compare to the wingspan of an albatross, expect to learn volumes while you walk through the many exhibits – several of which change regularly. But Bill Hanshumaker, who is responsible for many of the exhibits in the Visitor Center, says it is more than just a place to see an octopus and touch things in simulated tide pools. In fact, the day I visited the Center Hanshumaker was trying to figure out how to perfect a prototype exhibit showing how “dead zones” in the ocean are formed. “We have it figured out how to show how the wind will start to create currents, but the currents underneath the surface of the water is what we want to show, and right now we don’t have a material that will do it,” he said. As he huddled in his small office with a colleague, the two men sounded like scientists trying to figure out a problem – and settling on a solution. “That’s what we do around here,” he said. While the Center is a fun place to visit, at any given time research is taking place about the ocean, weather and even how people learn – or how to create the perfect exhibit. The Center is located next to Yaquina Bay and is operated by Oregon Sea Grant at State University and out front is small, yellow submarine – showing that this is a center that is committed to research. Docked out front in the bay are research vessels that regularly make trips around to continue the focus on learning about the ocean. What that means for visitors, is that depending on when you visit – there is always something new. “We will always have the octopus tank and the tidepools, because they are popular, but the other exhibits we are constantly trying new things,” he said. He even studied how people move through a facility like the marine science center and determined that people like going in a circular motion, so the exhibits are set up that way. He is full of stories about failed exhibits, and will point out how some things are missed and others are working as designed. Hanshumaker said people should expect to spend about an hour in the Center, not including time to pick something up in the gift shop. The Center is run on “suggested donations” and by far it’s the most educational time you will have in Newport. Hanshumaker suggests an early afternoon visit, as there is no human food at the Center. However it’s a different story for the animal feedings take place. About the Hatfield Marine Science Center: Oregon State University's Hatfield Marine Science Visitor Center creates a unique, dynamic environment for lifelong exploration and discovery. 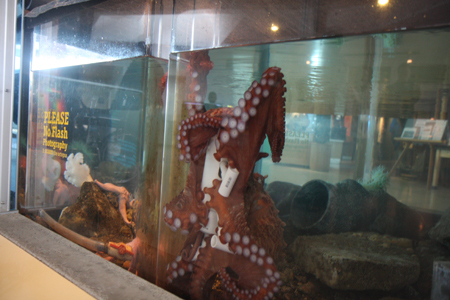 The Visitor Center encourages adults and children to enjoy marine science as they learn more about the natural world. Our exhibits, programs and classes demonstrate how scientific research enhances our ability to interpret the natural patterns and forces that shape our world, and equips us to better appreciate, manage and sustain coastal and marine resources. The Visitor Center also provides opportunities for conducting research on devices, methods and concepts for informal science education that will advance the art of life-long public education. What to bring: A good dose of curiosity and a donation. Photography is allowed, but please no flash photography of the octopus. Comfortable shoes will also help, since most of the areas are walking and there are limited places to sit. Tip: Hanshumaker says that most people go through only once and many exhibits are back-to-back, meaning you could miss several exhibits if you don’t go back through and take a different path. Also, make sure you stop and see the 3-D model of the planet earth, that shows everything from how weather patterns move, to how tsunami waves travel after an earthquake. Getting there: Enter 2030 SE Marine Science Drive, Newport, Oregon into the GPS and it should take you right there. Newport is an hour west of Interstate 5 via Oregon Highway 20, the quickest (and least curvy) route between the Willamette Valley and the coast. The center is on the south side of Yaquina Bay, near the Oregon Coast Aquarium.